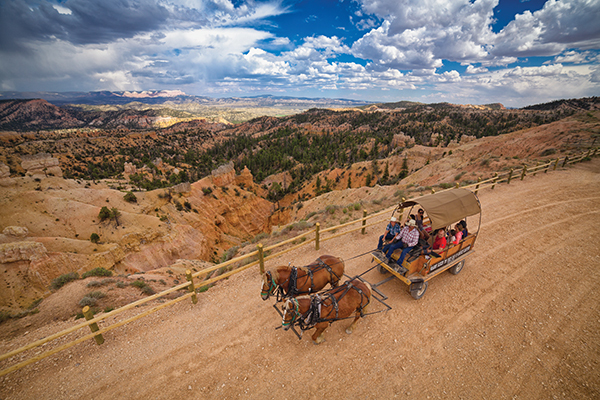 While there are thousands of reasons to take I-15 southbound, Utah Valley Magazine is naming seven reasons to hit red-rock country for the weekend … or longer. 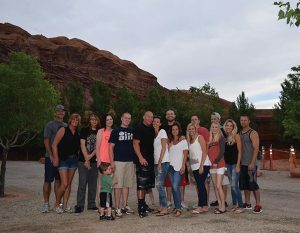 Jeeping with family draws Wayne and Stacey Zakotnik and their family to Moab every year where they enjoy their stay at the Moab Valley RV Resort & Campground. The line of cars heading south through Highway 6 illustrates how popular Moab is for Wasatch Front visitors. Count Wayne and Stacey Zakotnik as two of those Wasatch Fronters who make the trek to Moab at least annually to play in the dirt. When they aren’t on the area’s trails, they are shopping in downtown Moab and eating at their family favorites. They are also staying at Moab Valley RV Resort & Campground. Moab Valley RV Resort & Campground, owned by Highway West Vacations, is located just outside the main downtown area, making it close enough to enjoy the town, but far enough out to appreciate the natural beauty in a quieter space. The resort has different lodging experiences — from RV pads to tents to high-end, fully equipped cabins — so everyone can enjoy the level of camping they desire. The Zakotniks and other guests utilize the swimming pool, hot tub and other leisure amenities — which are always on the rise. Last year, in an effort to more fully serve the mountain biking community, Moab Valley completed a first-class mountain bike repair and wash station on site. They also have maps of various trails and friendly staff to help visitors plan adventures. Moab Valley RV Resort & Campground is one of three Highway West properties in the Moab area, along with Archview RV Resort & Campground and Canyonlands RV Resort & Campground. 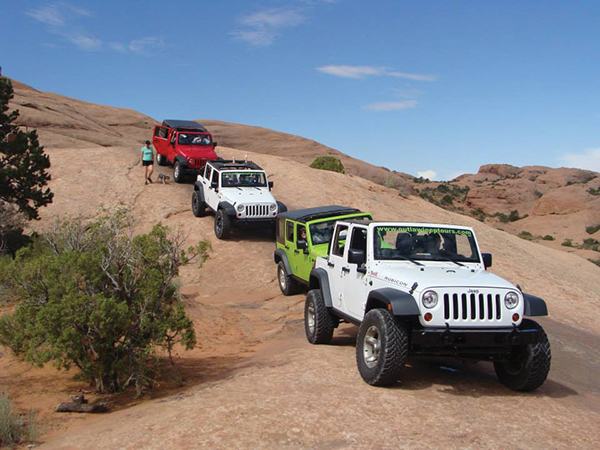 Moab Valley is the only one open year round, but all are devoted to the same level of service and enjoyment of stay. They make a trip to the dirt an enjoyable one. SunRiver in St. George offers comfortable community living and is a great spot for those looking for an active retirement. 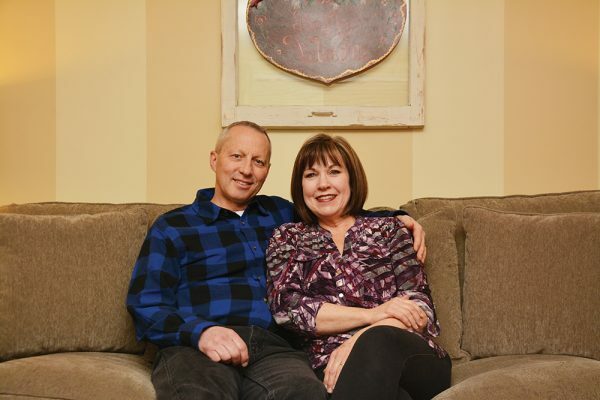 Doug and Betty Jo McKinlay look at life as a series of chapters. They loved the chapter where they raised their six children, spending most of that time in Connecticut. Then they had the chapter from 1996 to 1999 when Doug served as a mission president for the LDS Church in Arizona. 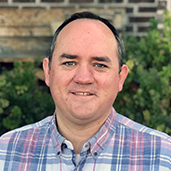 After that, the McKinlays moved to Cedar Hills and Doug began teaching advertising in the School of Communications at BYU. However, when he retired on Dec. 31, 2015, the couple was excited to start a new chapter in St. George at SunRiver. They also loved that St. George makes the drive to southern California — where the McKinlays have children living — a little easier. They also like that they are still only four hours from Utah and Salt Lake valleys. When they aren’t making efficient use of the interstate freeways to see grandchildren, the McKinlays are loving their new neighborhood. The McKinlays live in a gated part of the SunRiver community close to the clubhouse (86 steps from their house, to be exact) where they enjoy year-round access to a spa, a pool and a place to host larger family gatherings. “Some of our children were initially concerned with mom and dad moving to St. George, but they love it,” Betty Jo says. The McKinlays celebrated their 50th anniversary with a gathering at the clubhouse. Each of the six children, spouses and grandchildren had a great time. 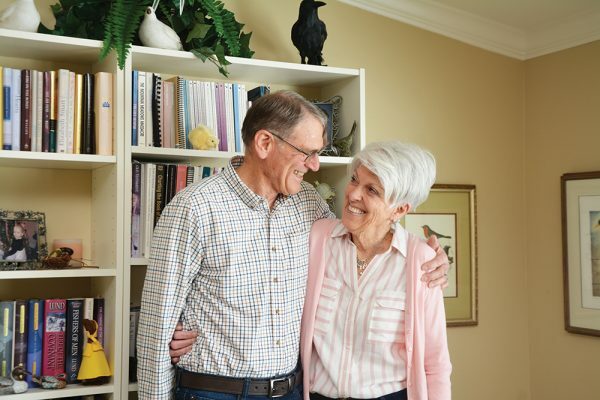 SunRiver is one of the popular locations that has pull retired Utah Valley residents — and others from around the country — to southern Utah for retirement. The development brings residents together through sports, clubs and service opportunities. SunRiver includes a golf course, pickleball courts and hiking trails perfect for an active lifestyle. For Betty Jo, she enjoys service opportunities. For example, recently the local residents made large Christmas stockings filled with hygiene necessities and small Christmas presents. They were then distributed to 80 refugee families living in the St. George area. The Painted Pony highlights the vibrant historic St. George downtown. One of the best parts of heading out of town is the chance to give your own kitchen a break. Heading south puts Utah Valley residents in contact with numerous flavors, environments and culinary creators. While Utah Valley families find plenty of options for the kids’ tastes, sometimes mom and dad need to get away and enjoy grown up time —and grown up food. The Painted Pony Restaurant — located in Ancestor Square in the heart of downtown St. George — is the perfect spot. Executive chef Randall Richards and his wife, Nicki, bought the restaurant in 2004 and work to offer the best ingredients, served fresh in the best combinations possible. The restaurant has a two-acre garden where the staff grows much of its own produce — especially root vegetables and, in the summer, heirloom tomatoes. All beef is hormone and antibiotic free. Fish is flown in fresh by sustainably responsible suppliers. However, it’s dinnertime when The Painted Pony comes alive. Dinner is served accompanied by fine linens and lit by candlelight. 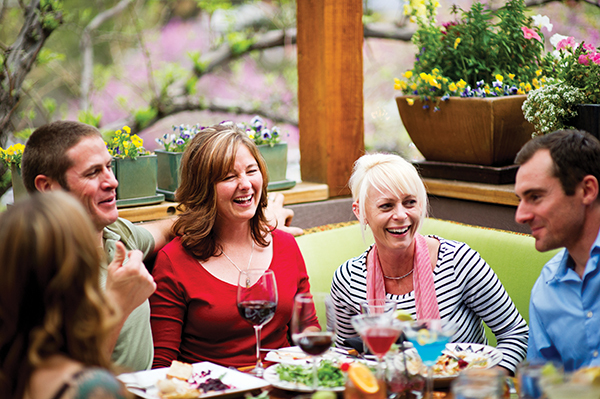 When the weather is good, patio seating under the stars adds to the gastronomical getaway. Part of the excitement of eating outdoors comes from the restaurant’s prominent location. The Painted Pony also wants to contribute to your next journey southward. St. George Area Parade of Homes. 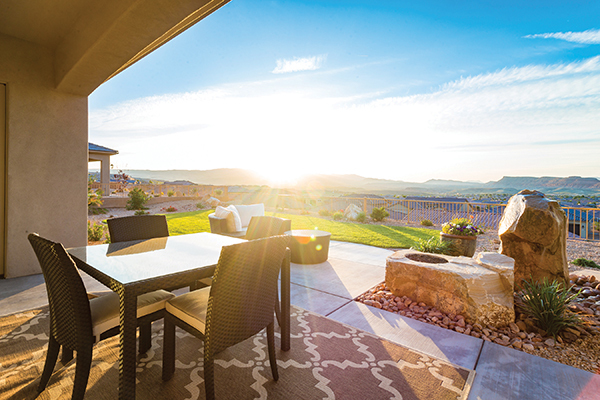 Utah Valley residents are no strangers to being inspired annually by the local Parade of Homes. For a Parade “warm up,” consider traveling to St. George in February for the St. George Area Parade of Homes. From Feb. 17 to Feb. 26, 28 new homes will be on display with creative indoor and outdoor spaces. 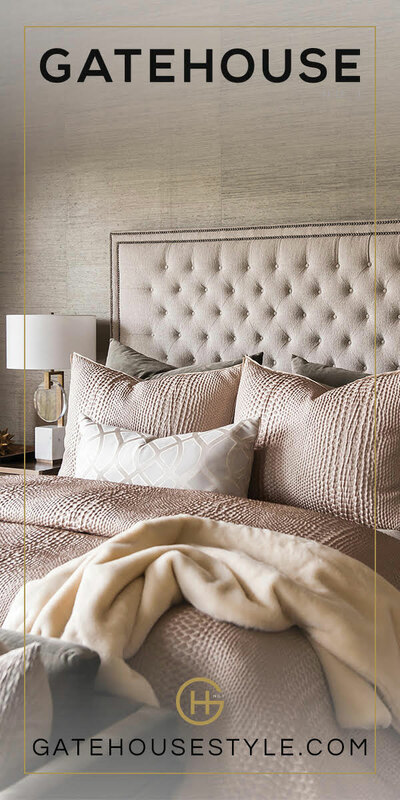 For more information, visit paradehomes.com. St. George living isn’t just for retired folks anymore. 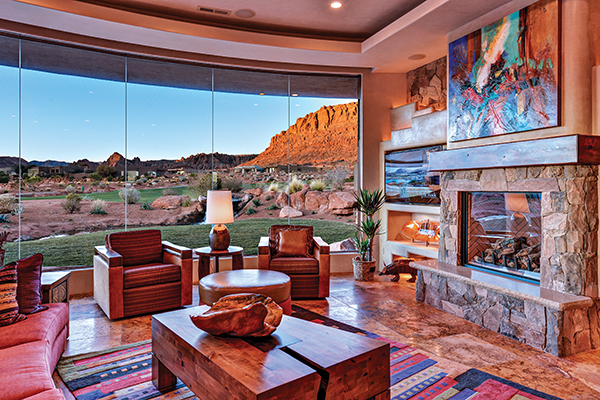 Having a second property in southern Utah allows families to visit as they please and have a place to call their own when they do. Pelican Hills Resort Condominiums is just such a place to call home. 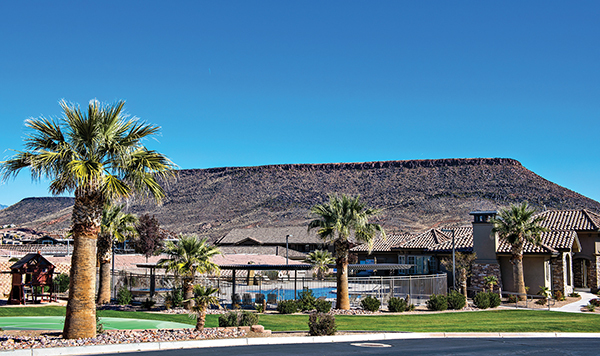 The quiet, resort-style living properties are not open to short-term rentals, so visitors enjoy less crowding and more relaxing than in other areas of St. George. The clubhouse — which is open to residents — includes a pool, a hot tub, an exercise room and a home theater room. The home theater includes captain’s chair seating and is perfect for a family movie or for watching the big game. Units range from 1,504 square feet to 1,632 square feet and each has three bedrooms and two bathrooms. The property is in the Green Valley area and is close to golf, Tuacahn and Snow Canyon State Park. For more information, call Alan at (435) 229-0675. The red-rock canyon surrounding the state-of-the-art theater at Tuacahn enhances every production — including this Peter Cetera concert. Real life can be hard. Mortgages, deadlines, errands and to-do lists. That’s why every once in a while, it helps to be taken to a far-away kingdom. 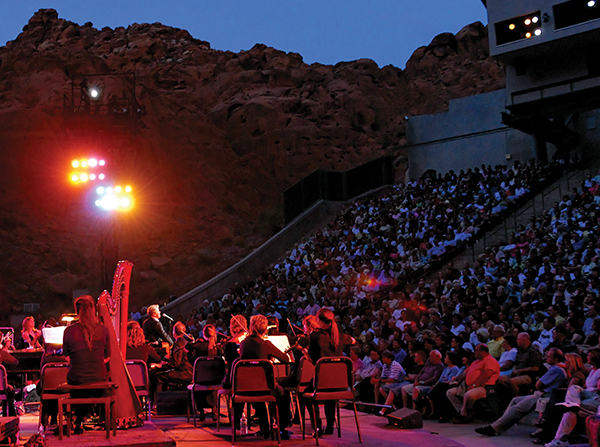 The Tuacahn Center for the Arts is one of the state’s best locations to enjoy such a journey. With a stage set against a majestic red-rock background, visitors for the 2017 season will enjoy such Broadway hits as Shrek The Musical, Newsies and Mamma Mia! The venue will also host concerts by Brian Regan, Peter Cetera and Clint Black. For more information, visit tuacahn.org. Ruby’s Inn offers a close, comfortable starting point for adventures to Bryce Canyon and beyond. On Feb. 7, 1987, Sandy Johnson’s two oldest children were coming home from LDS Church missions. With family coming in for the post-mission festivities, Sandy looked for a place that could house the family — and the fun. Last year, her extended family took up 40 rooms for children and grandchildren. 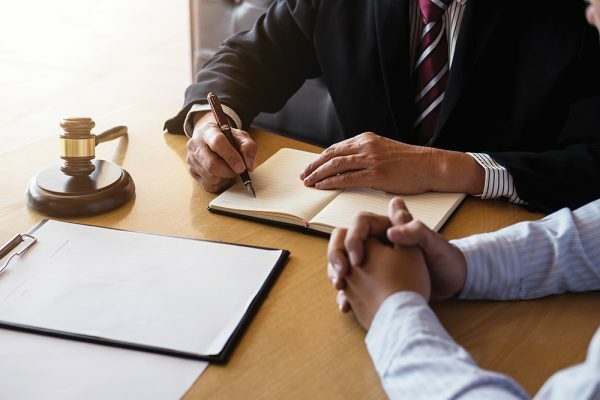 “We plan it every year for between January and March because there’s more availability and we can get better rates because it’s not the peak of the season,” she says. The inn hosts many of the family reunion’s activities. Sandy’s family has a talent show in one of the conference rooms and enjoys using the swimming pool area for the extended family, including her 12 siblings. Ruby’s Inn is a destination for many visitors to Bryce Canyon and is a great landing place for those searching for a southern Utah adventure. It can also be an ideal spot for a family gathering where everyone can find something to do.